We use authorised illegal drug samples controlled by the UK Home Office for dog training purposes. Each Drug Detection/Sniffer Dog passes high-level assessment standards and is subject to continued monitoring and performance checks. Skilled dog handlers are also highly qualified, experienced and expertly trained. Records of operational achievement are a testament to the quality of the training provided at SpecialistK9. Assessment of each work activity, hazard, risk and control measures allow handlers to operate safely. Following the commands of the handler precisely, each dog indicates the presence of drugs by giving a passive signal. The signal is either a sit or stand and stare option. From care units to commercial premises, drug detection sniffer dogs work to detect illegal drugs. Drug Detection Dog Teams operate at hospitals, centres, offices, factories, nightclubs, universities, colleges, schools and other vulnerable group meeting spaces and workplaces. Outdoor spaces such as markets, car parks, events, festivals can be the subject of detection dog checks. Some handlers have the experience necessary to assist at police raids and high profile security situations. Drug Detection Sniffer Dog training methods cover all environments. Cars, trucks, vans, motorbikes, buildings, industrial premises, factories, aircraft, boats and ships are all the subject of sniffer dog drug detection searches. Giving professional consideration to the work environment determines the correct approach. Perhaps a broad area sweep is essential or a close confined space drug search. 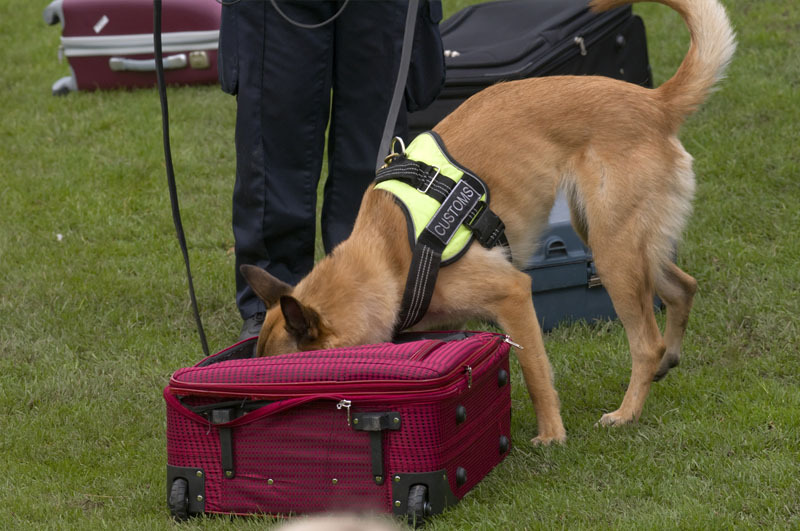 Whether an individual carries the drugs or they have secreted them within carefully concealed containers, the dogs are trained to detect and report findings to their handler. Each handler is up-to-date on current legal requirements and regulations. They are knowledgeable, experienced and trained in all matters relating to dog handling, use of working dogs as well as laws about the use of drugs. If you want to know more about how we train drug detection sniffer dogs to detect drugs in locations from bedrooms and dorm rooms to commercial properties nationally, please contact us.